The Musik Planet Recording Studio is located in Riverside, California. Sessions are available to book twenty-four hours a day. Ready to record your next hit album? Come into our studio. It's $100 per hour (includes a recording an engineer) with a two hour minimum. But make an appointment first! into hip hop? we get a lot of calls for recording or teaching skratching. here's an easy, affordable way to learn the art. 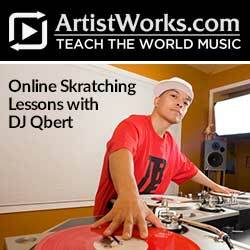 Try our online skratching lessons and make the kind of hip hop you want. Do it from home, at your own pace. Recording your own music is now easier and less expensive than ever before! The Music Planet offers classes on computer based recording, even if you have no previous recording experience. We offer hands on recording lessons that will turn you into a recording engineer in no time. Our lessons move at your pace, and cater to your areas of interest. Weather you want to record live instruments and vocals or produce hip-hop beats we can teach it all. Recording music is like capturing a moment in time, every recording you make is a memory that will last forever. Just as a picture is worth a thousand words, a recording is worth a thousand pictures. The art of recording music is very rewarding. There is nothing like listening to your finished song in your car or on your iPod and thinking “hey this sounds pretty good, and I recorded it all myself,” it is a very rewarding feeling. Being able to record yourself will also make you a better musician, because you can focus on areas in need of improvement by listening to yourself play. Furthermore, being able to use a recording program has unlimited benefits, you can record spoken word; voice-overs or even book readings the possibilities are endless. Learn how to turn your ideas into finished and polished recordings. Your creativity and songwriting capabilities will flourish and your songs will grow into pieces of music that will live on forever. With the knowledge you acquire from taking our recording lessons, you can capture your ideas instantly on the spot, you can grab those melodies (that go in and out of your head) and turn them into finished songs. This technology is here to help musicians, so you might as well use it to your advantage. Recording can be a lot of fun, it is an excellent way to spend time and bond with family and friends. And now that it is easier and cheaper than ever before there is no excuse for not learning how to use a recording program. Our hands on recording lessons are a great way to jumpstart your creative side. Please don't hesitate to stop by and check out our studio or contact us if you are interested in taking recording lessons, you won’t be disappointed. Classes are one-on one with a private instructor. Call for pricing and available class times. Take one class to brush up on what you already know or as many as you like!